Puppies are impressionable for the first 16 weeks of life. Both positive and negative experiences are etched into their memories that will greatly impact what kind of companion that puppy will ultimately become. Your breeder will be the responsible for half of this imprinting period. Even the best lines and pedigrees in the world need a positive and intentional imprint to live up to their potential. We take this responsibility of your puppy imprint very seriously. 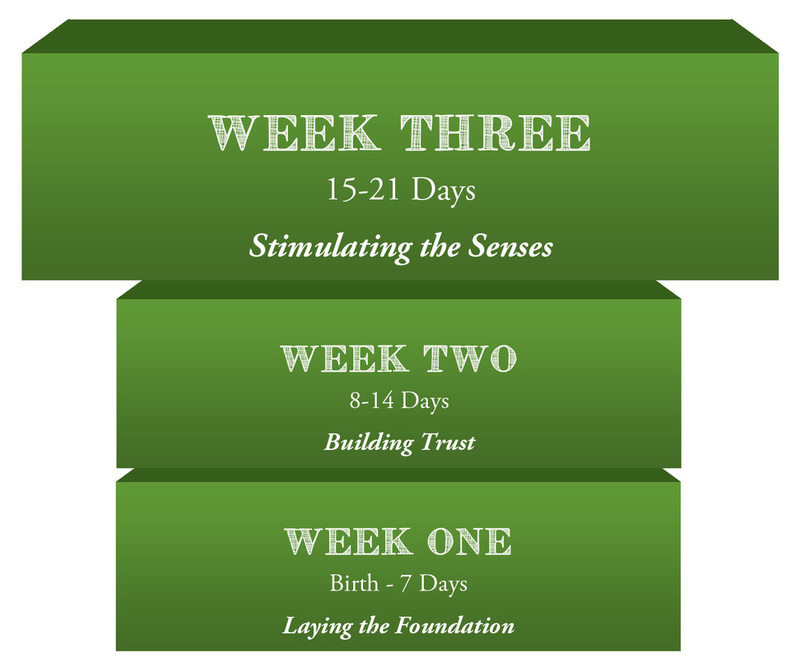 We realize that our care is all that they will know during those first formative weeks and it is our aim to introduce them to a world of healthy discovery, good behavior, and positive experiences. While it is true that some of this will happen naturally in a stable environment, it is the intentional and knowledgeable efforts that raise the bar to excellence in the imprinting process. What sets our imprinting and enrichment practices apart is our individual attention and care for each puppy. 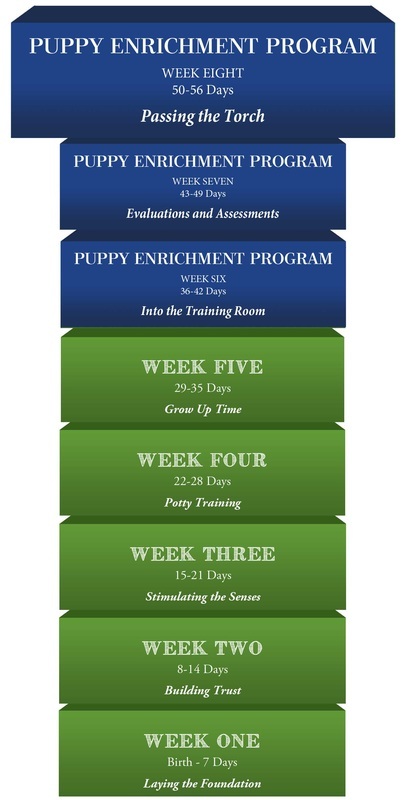 Our original idea of bringing our home to our puppies in the Puppy Barn provides a perfect environment to intentionally encourage development physically, socially, and emotionally, while addressing behavioral tendencies, using redirection and reward techniques. "Chance" Bella/Silas 2015 © Stephen C Wilkinson. 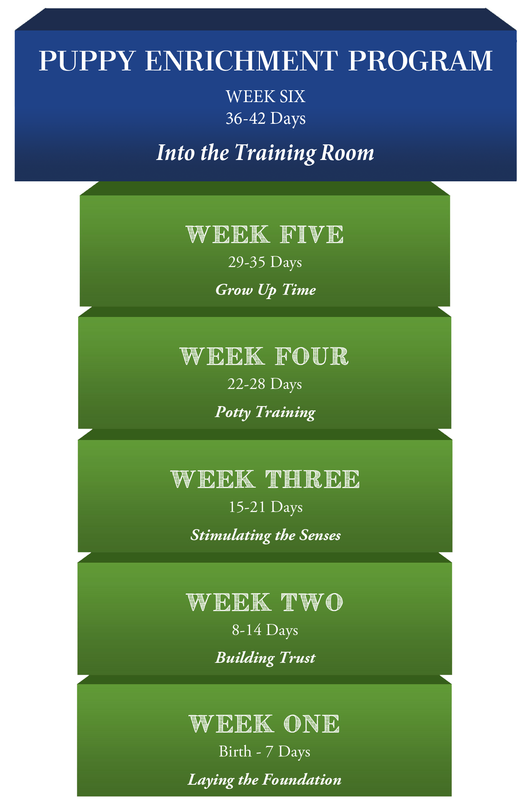 While we reserve detailed information regarding specific imprinting practices for our adopting families, below is a generalized view of the benchmarks we work to achieve each week with our puppies. A puppy's first week of life is all about laying a solid foundation and a trust in their human handler. As they cannot see or hear when they are born, it is even more crucial that we convey comfort and trust as we individually handle each puppy in the whelping pens where they are near mother and warm. For the next two weeks, a handler is present 24 hours a day. Pups are given a color ID (nail polish is applied to a small area of their coat to ensure a safe means of identifying each pup) and nails are trimmed regularly. Nursing is monitored to ensure each puppy receives their portion of milk and daily weights are taken and charted. From Day 3-16, ENS exercises begin (please click this link to read about this bio-sensor program). 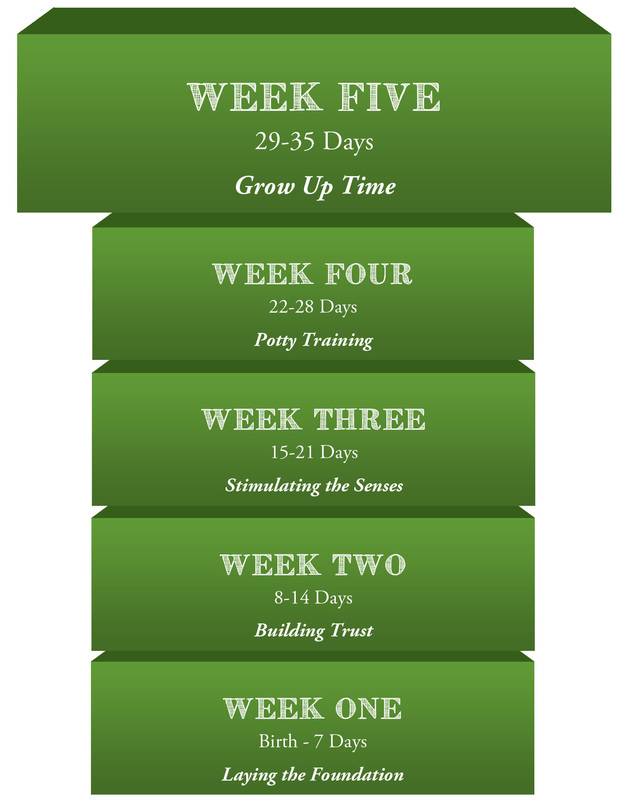 Each week, we build on the benchmarks and skills our puppies are acquiring. ​Our individual handling is intentional - using gentle massage techniques with each puppy. Many of our families continue to use some of these massage techniques with their Snitker Golden and report that it elicits a noticeable response in posture, body language and energy, and sometimes even vocally. ​​Handling is done both inside and outside of the whelping pen, as puppies now have their shiver reflex to keep themselves warm. All the while, we work to build on the trust we've established during Week One. Soft toys and other objects are introduced to the pen as puppies begin to find their legs and gently move about. These items are chosen and placed strategically to challenge and stimulate the pups' development. Puppies are hearing and seeing - sound socialization begins! Our sound socialization CD plays during supervised intervals during the day, while we also add more strange and startling noises as puppies tolerate, in addition to the normal, everyday sounds they've been experiencing from the general hum of human life. ​Pups continue to be handled individually and as a group with new handlers of different ages, gender, and experience. We introduce gruel later in this week and pups are washed on faces, feet, and tummies after each meal. To prepare for potty training, the whelping pad is removed and pups are introduced to wood chips. Pups are encouraged to interact with their toys in and outside of the pen as we introduce them to new surfaces and begin to use a potty box. Week Four is full of new experiences for our puppies. New surfaces, more sounds, extended handling individually outside and away from their litter-mates. Mothers are given more freedom and allowed time away from their pups, while pups have more independent time. After moving from a whelping pad to a larger area filled with wood chips, pups practice large and small group play in and outside of their newly enlarged pens. Different types of toys and materials are added for them to explore with. After meals, which is now a softened kibble and gruel, they continue to use a potty box, working to keep floors mistake-free. Powdered NuVet supplements, previously gained from mother's milk, are now added to the softened kibble as they learn to associate the taste with mealtimes. Water is made available for pups to hydrate when mother is out. As we ask our pups to continually build upon the skills they've learned, they take it to a whole new level during Week Five. Mothers begin gradually weaning towards the end of this week (completely weaning by Week 7), and dry kibble is added to their softened food as they transition. A den is added and their play area is enlarged again. "Settling" is a big skill we focus on, a hold that asks the puppy to be still until we release. Coming when called and rewarding pups with a treat encourages them to continue their positive responses with us and the pups graduate from nail polish to collars! ​Pups are given a clean floor space outside of their chips in which to practice potty training without supervision. Weather dependent, pups are also given free access to using the outdoors for play and elimination on their turfed play area. In pairs, puppies are initiated to crates in preparation for individual crating (at a later date). Pups are also introduced to some of our older Goldens during playtime for healthy socialization. Their first full grooming session occurs with a blow-dry and a photo shoot. Food comes to those who wait! Pups begin to learn to sit and wait quietly for food during this week as well - a great skill we encourage our families to continue. Enrichment. . . . "Enrichment makes something more meaningful, substantial, or rewarding. Enrichment improves something." (vocabulary.com). At Snitker Goldens, our program focuses on relationships. We feel our hearts alone enrich our puppy process, connecting and forming relationships with each of our puppies. And yet, we feel expanding experiences, teaching skills, reaching benchmarks, and providing a solid foundation for our puppies is extremely important in puppies' developmental process. This is our passion - to provide this enrichment for our puppies, and to improve their experiences so that healthy development can take place. "The importance of early socialization exposures and experiences in a puppy's life is key in helping them develop into a strong and confident dog. it is very important in the Service dog industry that responsible breeders not only breed the healthiest puppies possible but also have the dedication to ensure that a puppy has the right type of exposures in the early weeks of life. Snitker Goldens with Rhonda and her daughter Stephanie at the helm have this dedication and passion to breeding and laying the foundation for the best possible puppies. Veterans Moving Forward has been fortunate to have received three Snitker Goldens to date. The first puppy we received has gone on to be a Service Dog to a Veteran who has suffered multiple traumatic brain injuries. The impact that her Service Dog Prince has already made in her life has been amazing and life changing. Our second Snitker Golden pup is in the final phase of training and will be going to live with his Veteran in early 2017. Our most recent addition to our Assistance Dog in Training program from Snitker Goldens has just turned 10 weeks old and is on the path towards becoming a Service dog for a disabled Veteran as well. Properly socializing a puppy from birth lays the foundation for a well-adjusted dog. A puppy handled from birth learns to accept touching of all body parts from different people. Having a rich environment to be exposed to without pressure encourages a puppy to explore and investigate his environment without fear. Allowing a puppy to experience a variety of toys, games, surfaces and other stimuli makes for a well-rounded pup. Proper socialization engages all the puppy's senses through exposure to the sights, sounds and smells of day to day life. This gentle exposure will desensitize and condition the puppy so that he develops a comfort level with different and new situations. Early socialization helps teach the young puppy to handle new experiences and challenges with acceptable and appropriate behavior. 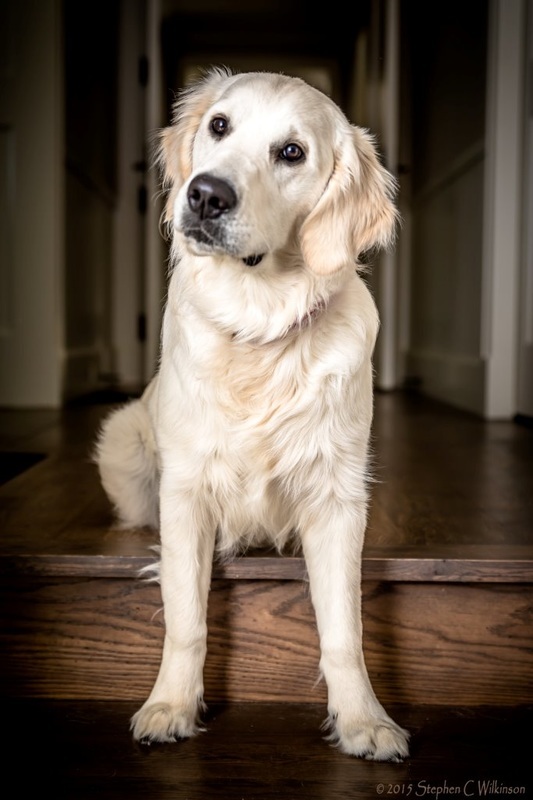 Rhonda and Stephanie at Snitker Goldens offer a high level of early enrichment to all their puppies to give them the best possible foundation to pursue whatever their ultimate path in life will be, either as a working dog or a cherished family pet." 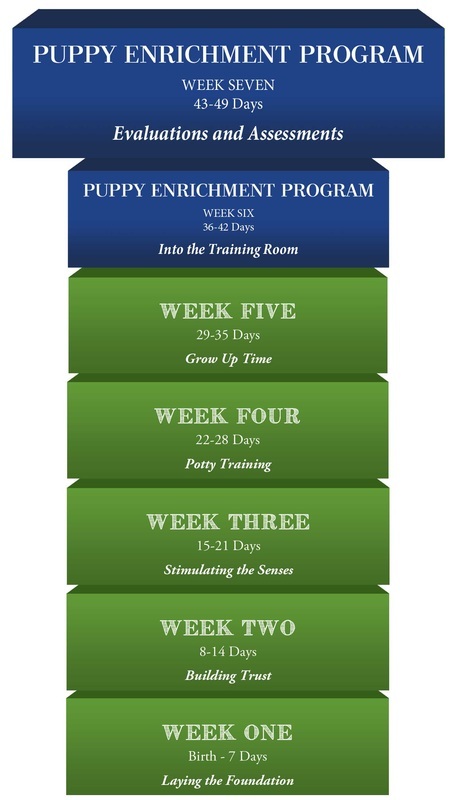 At six weeks, we begin what we call our "Puppy Enrichment Program." During this week and until puppies go home to their families at eight weeks of age, we are stretching their skills to further foster confidence and competency. Encouraged by our association with the service program, Veterans Moving Forward (VMF), we continue to add new dimensions to our program. Further and more detailed information about these practices is reserved for our clients who are watching their little ones grow and perform in their abilities and development. Pups are now eating dry kibble and fed individually as well as in groups. Their mother is still with them, but they are gradually being weaned. Supplements are offered by hand and/or in their breakfast dish. Guarding is screened for during individual meals as we put our hands and fingers in their food bowl. Pups are also touched and handled as they eat. Bite inhibition is a major benchmark this week as we redirect unwanted behaviors. Pups are also initiated (individually) to crates. Outdoor outings are planned (weather dependent) for them to experience snow, sand, gravel, and other outdoor experiences. The Training Room is unveiled and pups are given the ability to explore the play gym, pool, and tubes, as well as a variety of other new and challenging tools we use for development. Puppies are given more access and freedom to environments where they practice potty training with greater competency at this stage. Their first veterinarian visit is at the beginning of this week. Preliminary checks are done, microchips implanted, six week vaccinations given, and pups are registered with the AKC. Week Seven evaluations and assessments are a culmination of everything we have already learned about these puppies. Using Volhard and Clothier techniques, we assess how a puppy responds to a variety of situations, scenarios, and commands. 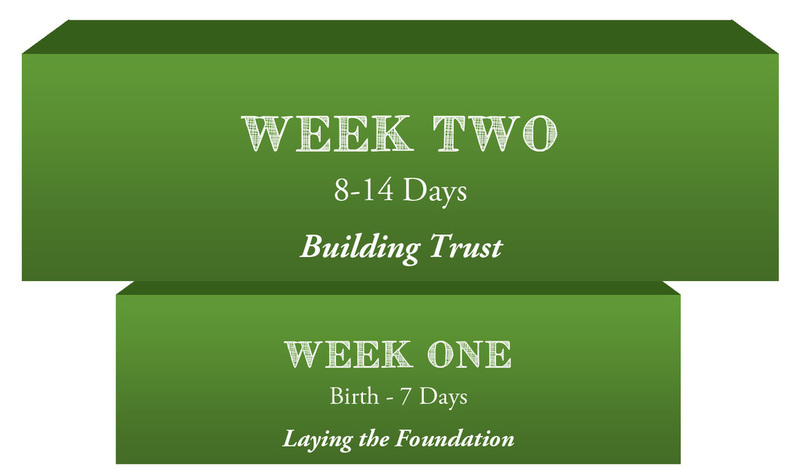 Placements with families are based upon the Family Profile Questionnaire (that each family fills out), the seven weeks leading up to the evaluations, and the seven week assessments. ​Puppies are completely weaned by the start of Week Seven and their pen is once again changed - giving them a small chip space and a larger space in which to keep mistake free. NuJoint Plus supplements are now added to their diet. ​Puppies have individual handling sessions both indoors and out (weather permitting). Leads are introduced and puppies experience their first car ride together - going as a group. Each week, we build upon past experiences to introduce new stimulation by sight, sound, and touch - this week is also filled with additional new experiences to challenge them. Our final seven days remain with our pups. For the past two months, we have focused intentional and intensely on providing them with a host of skills, opportunities, and challenges. Week Eight is very much a passing of the torch, trusting our families to lovingly continue the life enrichment these Goldens need. Puppies go on their final group car ride, have their final health exams, their final grooming sessions and blow dry. Much of what we do is their last experience with us as a Snitker Golden puppy. Trust has been built. Security and comfort associated with human hands and voices. We're excited to meet our families and introduce them to these little lives we were entrusted with. These puppies have been like little people - all with their own bent, personalities, strengths and areas of growth needed. We've had laughter and tears. Days of enormous progress and days where we hoped they would have progressed more. Every new puppy owner wants the same thing - the perfect puppy for them. We believe that puppies are very much like children - each coming into this world with a host of wonderful attributes, and things he or she has to work on. This is true for every puppy. This is true for every person. Having said the above, we believe if experienced and knowledgeable handlers are working with your pup in the imprinting period, every puppy is a great puppy and each will bring his and her own flavor to their forever families. ​We want to thank you for the trust and responsibility you have given us in raising your puppy. It has been our pleasure.